Children’s cartoon ballet class lessons, strict ballet teacher. It’s nice to have some time to experiment with different styles of cartoon. I find it hard not to add colour but sometimes the simplest images have the greatest impact. This years christmas card for my lovely wife, we go together like walking and whiskey…you can’t have one without the other ! Quick caricature of Alan Partridge…AH HA ! 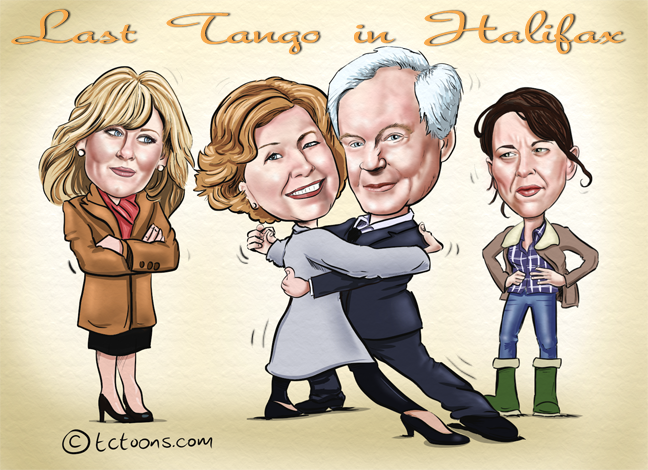 Last Tango in Halifax cartoon caricature painted with artrage studio pro. Last Tango in Halifax is a British romantic drama series that started airing on BBC One on 20 November 2012. The series was written by Sally Wainwright, who was inspired by witnessing the happiness her mother’s second marriage brought her late in life. Last Tango in Halifax stars Derek Jacobi and Anne Reid as widowed septuagenarians, Alan and Celia, childhood sweethearts who have been apart for 60 years. Re-united via a social networking site, they meet, fall in love and plan to marry. Reid and Jacobi enjoyed having the chance to play out a love story between older people that was not ageist or stereotyped. Sarah Lancashire and Nicola Walker star as Caroline, Celia’s daughter, and Gillian, Alan’s daughter. There is a lot wrong with this Comic book style illustration but I like the general look. I need to study some anatomy.